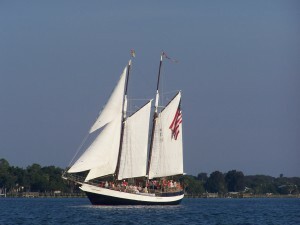 Schooner Freedom under full sail. Freedom is an authentic replica of a 19th century blockade-runner. She is a double masted, gaff-rigged, topsail schooner. Naval architect Merritt Walters and his marine construction company, Rover Marine, Inc., designed and built Freedom, the first of his many Rover schooners, in 1982 in Norfolk, Virginia. 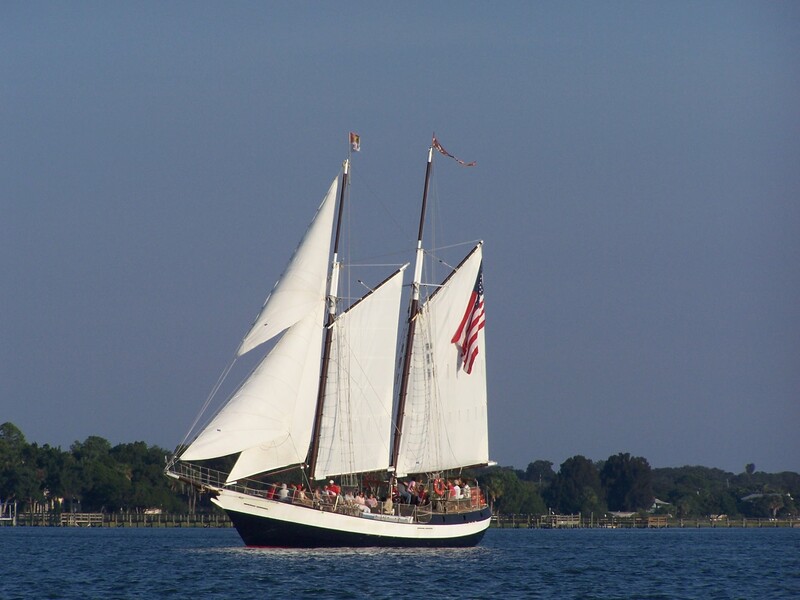 The Schooner Freedom is built of steel with aluminum masts and spars. The Freedom’s sparred length is 76 feet while her length on deck is 64 feet. Freedom’s beam is a 15 feet 4 inches and her draft is 6 feet. Her main mast height is 62 feet and she carries a total sail area of 2400 feet. Freedom was built with stringent attention paid to water depth and bridge height along the Intracoastal Waterway, making her the perfect vessel for both inland and offshore sailing. The Freedom was the first sailing tour boat to be certified under the Coast Guard sub-chapter 'T' to carry passengers for hire since the great days of sail. Under this certificate she is licensed to carry forty-one passengers and required to have a master and two crew members. John & Sarah have been sailing for most of their adult lives. Over the years, John and Sarah owned and sailed on a 32 foot West Sail sailboat they rebuilt and named the Athene. They logged hundreds of miles under the keel, sailing between Charleston, South Carolina and Key West, Florida. 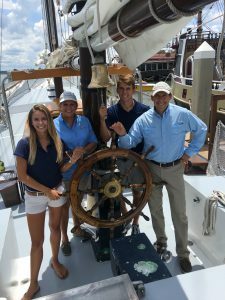 John and Sarah purchased the Schooner Freedom in 2000, completed a year-long refit, and launched her in 2001 as a charter boat in St. Augustine, FL. John and Sarah's love to share their passion and love of sailing with others. Captain Steve, born and raised in Chicago IL, has always been drawn to the water. He is new to, but already in love with St. Augustine. Steve started his warm weather life in 2010 when he moved to Fort Lauderdale to pursue a life on the ocean. Since then he has become a full time live-aboard sailor. 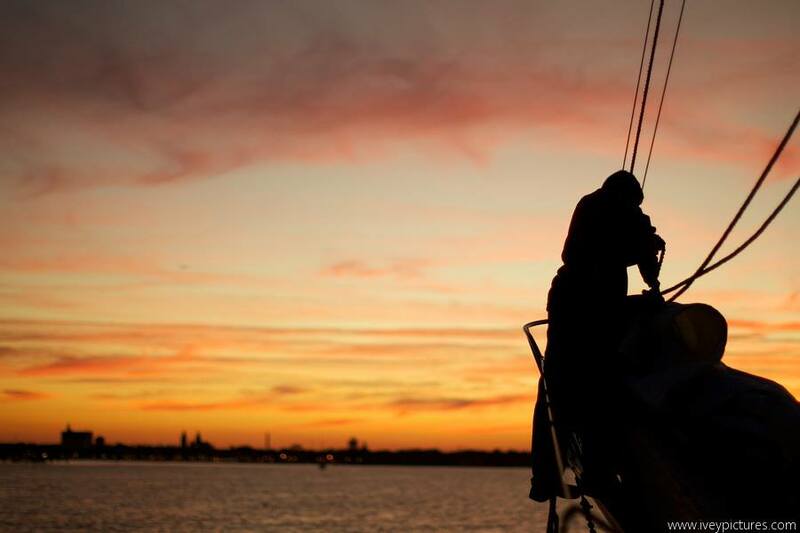 He has spent the past 7 years sailing and living on his own 37' sailboat. He travels have taken him as far South as Guatemala and as far north as New England. 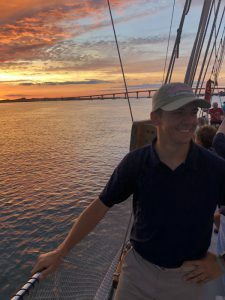 Spending more time on water than dry land, Steve loves to share his deep passion and love for the ocean and sailing with our guests aboard Freedom. Sydney has been sailing her entire life. Born and raised on her parents boat, the Athene, Sydney went sailing for the first time at the tender age of 6 days old, and hasn't stopped since. 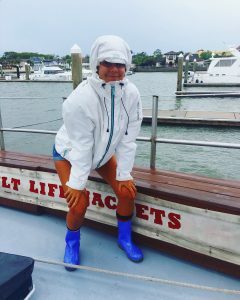 Since the Freedom's launch in 2001, she has been either below decks, doing homework, above decks, working the sails, or behind the scenes, working the office and as our resident blogger and social media expert. She recently graduated the University of Florida as a Broadcasting and Communications major and is a world traveller and yogi, always looking for the next adventure. 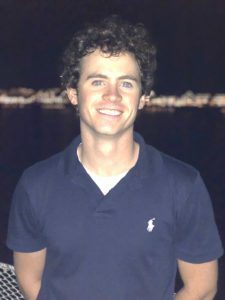 Jack, the second and youngest child to John and Sarah, is 18 years old and is attending Fort Lewis College in Durango, Colorado. He has been on ships his entire life, and joined the ranks of the crew at a young age of 2, being the favorite of many a passenger aboard ship. 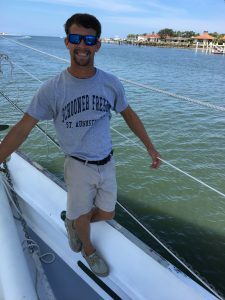 He will be trading in his sea legs for mountain legs while in the Colorado Rockies, but will return to a life at sea during the summer. Jack is a natural athlete and cannot wait to start up school and see what the future has in store for him. BJ is starting college this fall at Eckerd College in St. Petersburg. He has grown up in Lake City and St. Augustine FL. He enjoys everything on the water. From learning to sail on the Freedom to fishing to surfing. BJ is studying Marine Science and plans on being a member of the US Coast Guard, but meanwhile he hopes to spend his summers on the Freedom during his time at Uni! Brian Huffman is a recent graduate of the University of Florida in Sports Management, and a born and raised Saint Augustinian!! With a Minorcan family background, he is learning the ways of the water while waiting to attend nursing school in the near future. 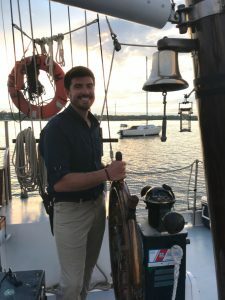 Brian has always been around the water, but this is his first time testing the waters of sailing, and he enjoys sharing stories with both tourists and locals like on board the Schooner Freedom! Lauren Schroeder is a Flagler College student majoring in journalism with a minor in environmental science. Having been born and raised in small town East Greenville, Pennsylvania, she moved to Florida to be closer to the water. 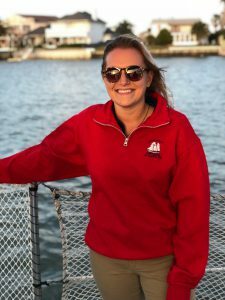 After transferring from University of Tampa in the fall of 2017, Lauren fell in love with St. Augustine. 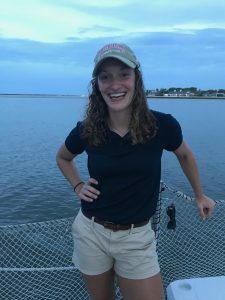 Working on the Schooner Freedom has provided Lauren with a job that also encompasses her passion for the environment and ocean. Sadie is originally from Tallahassee Florida. She is a Flagler College graduate and enjoys spending her free time on the water, swimming and surfing. She is a behavioral assistant for children with special needs during the week. She enjoys spending time on the Freedom and learning more about sailing. Originally from New York, Gina attended Belmont in Abbey, NC with a BA in psychology. She moved to St. Augustine from NY in 2013 after owning a spa for 7 years. Gina Has one fur baby named Lola. Gina Loves to bake, be in the sun, travel, and living close to the beach is a dream come true. She is currently learning Italian, and is happy to be the Freedom's Office gal extraordinaire! Daniella is a full time Flagler student with a double major in History and Spanish. She was born and raised in South Florida, and came to St. Augustine to immerse herself in the rich history St. Augustine has to offer. On her time off, she loves to study languages and is now trying her hand at Latin, Spanish, and Portuguese. She began working for the Freedom in April, where she mans the office, books the reservations, and ensures everyone boards the Freedom with smiles on their faces.